This publication provides feeding recommendations for the use of wheat in beef cattle. Wheat remains one of the leading crops produced in North Dakota. Most wheat in North Dakota is hard red spring wheat (HRSW) or durum. Small acreages of hard red winter wheat and, more recently, hard white wheat also are planted in the state. Wheat is not used traditionally as a feed grain because its milling properties make it desirable for use in breads, pastas and noodles. At certain times, however, wheat is priced competitively with other feed grains due to damage from disease, drought or sprouting. Feed-grade wheat is a palatable, digestible source of nutrients that can be used in beef cattle diets if fed with caution to avoid digestive upsets. 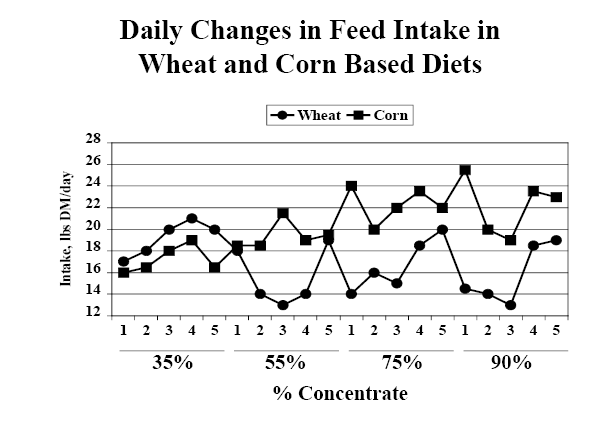 The nutrient content of wheat, wheat byproducts and selected feed grains is shown in Table 1 . Wheat is low in fiber and high in starch content, and has an energy value (total digestible nutrients [TDN], net energy of maintenance [NEm], net energy for gain [NEg]) similar to corn. Wheat is higher in protein than other common feed grains such as corn, barley or oats. Within wheat classes, HRSW has the highest protein content, with hard red winter wheat and durum being slightly lower. All cereal grains generally are low in calcium and adequate in phosphorus for all classes of beef cattle. Low fiber levels and a rapid rate of starch digestion make wheat more difficult to feed than most other cereal grains. The starch in wheat is fermented more rapidly than the starch in corn, resulting in greater potential for digestive upset, acidosis, bloat and founder, and reduced and/or erratic intake patterns. Figure 1 shows relative rates of fermentation for major feed grains. Processing wheat substantially improves digestibility due to the hard seed coat associated with the kernel. According to research published in Australia, whole wheat has a digestibility of 60 percent, compared with 86 percent for wheat that is rolled. However, attention to processing is crucial for best results when feeding wheat. Wheat should be rolled coarsely (breaking the kernel into a few pieces), but not ground, for best results. Creating excessive fines or floury material should be avoided. Small particle size increases the rate of digestion. When excess fines are present, an increase in digestive problems such as bloat, founder and acidosis can be expected. Because of its feeding characteristics, levels of wheat in the ration should be limited. In moderate to high-grain rations (50 percent or more concentrate), wheat should be fed in combination with more slowly fermented feed grains and limited to 40 percent of the total diet to prevent or reduce the risk of digestive upsets. What is important is to adapt cattle to wheat gradually so that you avoid overconsumption. Adapt cattle by introducing wheat into the ration at low levels (10 to 15 percent of the diet) and increasing the level in steps or increments (10, 20, 30, up to 40 percent) after a period of several days of constant intake and appetite. 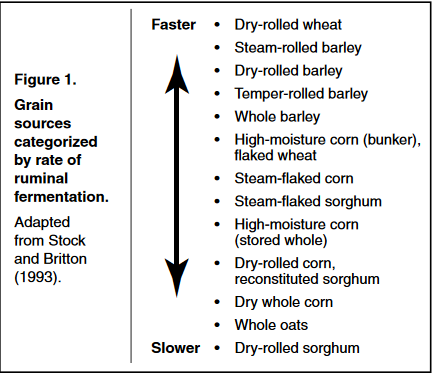 Figure 2 (below) details research conducted at the University of Nebraska that shows the erratic intakes that cattle sometimes experience as they adapt to wheat-based finishing diets. To avoid problems with wheat-based diets, cattle should not be moved to higher-concentrate levels until intakes are consistent. Problems with overconsumption (such as bloat, founder and acidosis) can be minimized by limit feeding, feeding two times or more per day, providing plenty of roughage and feeding a total mixed ration. Self-feeding wheat should be avoided. In addition to limiting the level of wheat fed, feeding with other grains such as corn, coarse processing, adapting cattle slowly and good bunk management have been shown to be helpful when utilizing wheat in the ration. For growing and finishing cattle, including an ionophore will help reduce overconsumption and acidosis. Kansas research indicates that the addition of an ionophore/antibiotic combination to wheat-based finishing diets improves feed efficiency. Using buffers (such as limestone) in the ration, particularly as cattle are being started on concentrate diets, is beneficial. Rations should be formulated to contain a minimum of .7 percent calcium (with the majority of the calcium coming from limestone). The addition of sodium bicarbonate to wheat-based rations has, at times, improved daily gain and feed conversions, according to research conducted in Kansas. 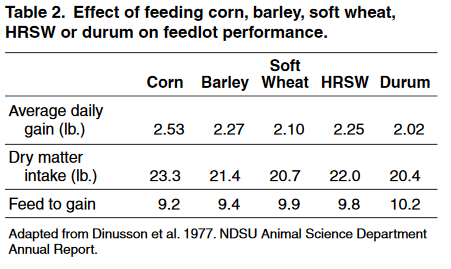 Research conducted at NDSU that compared durum with HRSW indicated cattle fed durum consumed less feed and had poorer feed conversions, compared with cattle fed barley, corn or HRSW. Table 2 details the results of this feeding trial, which compared feeding corn, barley, durum, soft wheat and HRSW to finishing steers. The diets averaged 73 percent grain for the wheat- and corn-based diets and 81 percent grain for the barley-based diet. Grains were coarsely rolled prior to feeding. 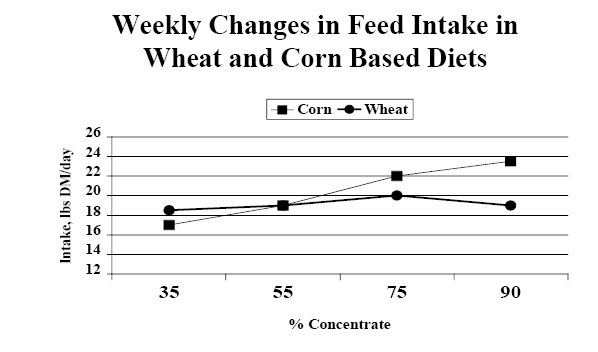 Average daily gains, feed conversions and intakes were poorer for the durum diet, compared with corn or HRSW. This indicates that durum should be included at lower levels in the diet (30 percent or less), compared with HRSW. Rolled or cracked durum can become pasty and sticky. This is related to its gluten strength and may be part of the reason that durum is more difficult to feed than HRSW. Wheat that is economical to feed often has been discounted for a variety of reasons. Generally, cattle fed wheat with test weights greater than 56 pounds per bushel will have similar conversion rates. Very low test weight wheat (less than 56 pounds) will be useful as feed, but energy values will be lower and feed conversion rates poorer. Low test weight wheat may be more difficult to process properly, compared with higher test weight wheats. Kernel size is more variable with low test weight grains, making processing more difficult. When the roller is set properly for larger kernels, many small kernels will pass through the rollers unprocessed. When set properly for smaller kernels, many larger kernels will be processed too finely. In the case of wheat, err on the side of underprocessing rather than overprocessing. vomitoxin-infested barley indicates no apparent problems when fed to growing and finishing cattle or gestating or lactating beef cows. Research conducted at the University of Minnesota indicates that cattle can tolerate high levels of vomitoxin (21 parts per million of DON) without noted impacts on performance or health of the cattle. However, exercise caution with wheat or any grain that has gone out of condition or has mold damage. The possibility exists that molds and toxins will impact feeding value through reduced feed acceptance, intake and performance, as well as higher incidence of morbidity, the possibility of abortion in pregnant cattle and, in some cases, even death. Young calves, gestating cows and animals under nutritional stress are most vulnerable. High levels of ergot in wheat are also a concern. Ergot concentrations in grain greater than .1 percent have been shown to affect animal performance. Sprouted grains are similar in feeding value to undamaged grain when fed to cattle. Nutrient levels in sprouted grains tend to be slightly higher than in nonsprouted grain due to the concentration effect that occurs as certain nutrients are utilized during germination. However, no significant differences in cattle performance were detected when sprouted wheat replaced nonsprouted wheat in the diet. 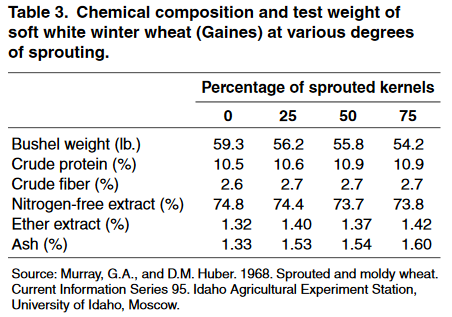 Table 3 gives data on the effect of sprouting on nutrient content of wheat. See NDSU Extension Service publication AS647, “Feeding Value of Sprouted Grains,” for more information. Little data is available regarding the feeding value of frosted wheat. However, research conducted in Alberta with frosted barley indicates no difference in feeding value of frosted grain, compared with sound grain when fed in feedlot diets. Drought-damaged wheat generally has smaller kernels and is lower in starch content than wheat grown without drought stress. Nitrate toxicity should not be a concern with wheat grain. Wheat does not transfer nitrate into the seed during drought stress. Significant discounts on wheat not meeting grade standards in traditional markets will at times price wheat very favorably as a feedstuff. Such situations create opportunities to utilize wheat in achieving low-cost gains and reduced feeding costs. However, feeding wheat requires careful attention to feed processing, ration formulation and feeding management for optimum results. • Limit wheat to 40 percent or less of the ration in backgrounding and finishing diets. • Limit durum to 30 percent or less of the ration in backgrounding and finishing diets. • Ionophores should be used with wheat-based finishing diets to improve feed efficiency and reduce the risk of acidosis. • Buffers such as limestone and sodium bicarbonate may be useful in alleviating or preventing digestive upsets. • Adapt cattle to wheat-based diets incrementally, starting with low levels (10 to 15 percent) and then gradually increasing the wheat level up to 30 percent (durum) to 40 percent (hard wheats) over the course of two to three weeks. • Wheat should be rolled coarsely or cracked, but not finely ground, for optimum performance. • When used as a supplement for beef cows, hard wheat levels should be kept under 5 to 6 pounds per head per day (3.5 to 4.5 pounds for durum). • When used as a supplement, wheat should be fed every day (as opposed to every other day or every third day). • Do not use wheat in creep rations. The rapid rate of starch fermentation increases the risk of digestive problems such as acidosis, founder and/or bloat. • Wheat should not be fed in self-feeders. • Damaged wheat (sprouted, frosted, drought-stressed, vomitoxin-infested) can be fed after careful inspection and laboratory analysis of the condition and quality of the grain.